Thank you on behalf of the Gaming Technologies Association (“GTA”) and its members for the opportunity to provide input to this inquiry. For too long, the debate about gambling in Australia has been based on myths and misconceptions fed by self-styled “experts” whose detailed knowledge appears to be based on opinion only. There are no experts on the supply of gaming machines in Australia other than the members of GTA’s Technical Committee, whose professional lives revolve around supplying gaming machines. GTA advises the Committee that the dates outlined in the Bill for implementation of voluntary pre-commitment cannot be met. GTA has repeatedly advised the Committee that poker machine game software is complex and comprises over one million lines of code, along with several million more for the operating system. The process of redeveloping such software to change its functionality consumes extraordinary levels of skilled resource and time. Before such a redevelopment process can begin, functionality must be clearly defined so that technical requirements can be developed. At this time, no functional specifications appear to have been contemplated. When asked, the Problem Gambling Taskforce, in the Department of Families, Housing, Community Services and Indigenous Affairs, has advised that work has not commenced on the functional design. This means that while everyone is talking about pre-commitment, no one in the Government can explain what that means in practice for the design of the gaming machine and its software. Until this is known, any estimates of the cost are guesswork. Further, each State and Territory has its own existing technical requirements which must be augmented by clearly defined pre-commitment functional and technical requirements before redevelopment can begin. This means that key jurisdiction-based dependencies must be considered in order to avoid multiple cost cycles in each jurisdiction. As the suppliers of all new gaming machines in Australia, and the sole body of industry technical expertise in gaming machine design, GTA states categorically that the implementation timelines in the Bill cannot be met. GTA is a not-for-profit company limited by guarantee, established in 1990 for the purpose of promoting the development of Australia’s manufacturing resources. GTA’s primary members provide gaming technology and equipment to hospitality venues in over three hundred jurisdictions worldwide, eight of which are in Australia. GTA’s primary members include Ainsworth Game Technology, Aristocrat Technologies, Aruze Gaming Australia, Bally Australia, IGT (Australia), Konami Australia, SHFL entertainment (Australasia) and WMS Gaming Australia. GTA members supply all of Australia’s new poker machines. All GTA’s primary members are public companies or part of a public company and their primary focus is the development and supply of new games and gaming machines. Any substantial changes to the poker machine software supplied by a GTA member must be implemented by that respective organisation. For too long, the debate about gambling in Australia has been based on myths and misconceptions fed by self-styled “experts” whose detailed knowledge appears to be based on opinion only. There are no experts on the supply of gaming machines in Australia other than the members of GTA’s Technical Committee, whose professional lives revolve around supplying gaming machines. GTA has sought to dismiss some of these myths as evidenced by the facts provided to the Committee in response to questions on notice resulting from its public hearing on 2 May 20121. These responses involved game development, hourly expenditure, market research, maximum bet limits and messages. GTA supports the establishment of an Australian Gambling Research Centre (AGRC). However, we understand that its preliminary annual budget would be $1.5 million and this is not sufficient. GTA’s view in relation to an AGRC budget is based on experience. The cost of the landmark University of Sydney research project which resulted in its report of November 20012 and is still widely referenced, exceeded $1 million in today’s dollars (including $260,000 to reconfigure a small number of machines). GTA anticipates that the AGRC would be requested to undertake several such studies in its first year; accordingly, its annual budget should be more than $5 million. As a result of their worldwide operations, GTA’s primary members are acutely aware of global developments and requirements in relation to gaming technology including efforts to address problem gambling. An early AGRC priority should be a global review of such developments and trials of applicable technology in Australia. GTA supports a pre-commitment field trial. However, commencement of such a trial is not possible by February 2013. GTA has previously advised the Committee that the redevelopment and supply process takes at least a year for one game. 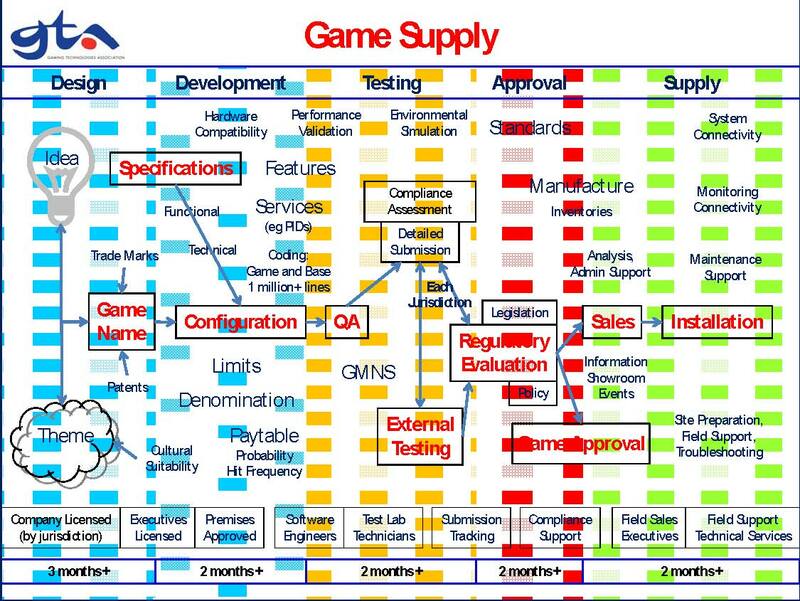 This schedule starts when functional specifications are agreed and is for the first redeveloped game as outlined in GTA’s game supply flow chart (previously provided to the Committee and attached at page 6). A schedule for all games in Australia to be redeveloped depends on a myriad of internal and external factors, but will be several years. At this time, no functional specifications appear to have been contemplated and will in all probability not be contemplated until after a pre-commitment system provider has been nominated and requirements of them have been specified. As we understand it, the Australian Capital Territory is considered likely to host the field trial. The Territory is the only Australian jurisdiction in which a Centralised Monitoring System does not operate. Such a system must be implemented before a pre-commitment field trial can commence. Further, no redeveloped games can be supplied to a February 2013 schedule. The one year “first game” redevelopment and supply schedule and the several years “all games” redevelopment and supply schedule will remain. The measures contained in the Bill have not yet been subject to field trial; accordingly, stakeholder review has been based on supposition. At no stage has it been conclusively proven that pre-commitment is an effective measure to reduce problem gambling. Until the completion of the proposed field trial and the completion of the Productivity Commission review of results of the field trial, the Bill should reflect that no commencement date can be specified with certainty for pre-commitment. The Bill requires that a gaming machine must provide warnings electronically relating to its use, among other matters3. Until the completion of the proposed field trial and the completion of the Productivity Commission review of results of the field trial, the Bill should reflect that no commencement date can be specified with certainty for dynamic warnings. In any event and as general principles, dynamic warnings should not be simply broadcast unsolicited messages; and should not be displayed unless a player’s activity is extraordinary when compared to their previous patterns of play. These and other facets of dynamic warnings should be thoroughly researched and then field trialled before they are considered for implementation. GTA has previously advised the Committee that poker machine game software is complex and comprises over one million lines of code, along with several million more for the operating system. The process of redeveloping such software to change its functionality consumes extraordinary levels of skilled resource and time. It is preferable to incorporate revised functionality into new games. Before such a redevelopment process can begin, functionality must be clearly defined so that technical requirements can be developed. At this time, no functional specifications appear to have been contemplated; hence the process outlined in the attached Game Supply chart cannot begin. Further, each State and Territory has its own existing technical requirements which must be augmented by clearly defined precommitment functional and technical requirements before redevelopment can begin. And in addition, current replacement cycles do not accommodate short-term re-supply. As an example, the number of new games and gaming machines in NSW clubs and hotels in the 12 months ended 30 September 2012 was 9,623 or around 10% of the 94,231 gaming machines currently operating in those locations. Another complicating factor is that each jurisdiction (except the ACT) has at least one gaming machine monitoring system currently operating. A new monitoring system is currently being rolled out in Victoria and the current NSW monitoring licence term expires in 2016. Each time changes are contemplated in each jurisdiction, redevelopment of game software is likely to be required. Accordingly, GTA does not support the dates outlined in the Bill for its application4 and advises the Committee that the current timeline is not possible. The Bill should instead specify that the development of revised functionality must be completed by consultation with relevant stakeholders; and that its subsequent implementation should then commence according to venues’ machine replacement programs. Gaming machines are currently imported and exported, typically in the form of hardware only. Whilst GTA has obtained the Department’s advice that s80 of the Bill will not impact the import of such equipment, GTA will seek to reconfirm this matter with the Department. The definition of precommitment capability is not clear and should be agreed as a priority. GTA assumes that the Expert Advisory Group on Gambling contemplated in s197 will be a continuation of the former Ministerial Expert Advisory Group which met in 2010-2011. GTA notes that this body must include industry representatives to provide valid advice on strategic direction on global developments and requirements. We support the establishment of an Australian Gambling Research Centre, but with an annual budget of more than $5 million. We support a pre-commitment field trial; however, commencement of such a trial is not possible by February 2013. We support incorporating revised functionality into new games and machines. The Bill should be amended to reflect that no commencement date can be specified with certainty for pre-commitment or for dynamic warnings. The Bill should be amended to specify that the development of pre-commitment functionality must be completed by consultation with relevant stakeholders.